The Book Chook: Happy Anniversary, Little Golden Books! Happy Anniversary, Little Golden Books! This year is the 75th anniversary of Little Golden Books. Do you have as fond memories of these gold-spined books as I do? My old favourites are The Poky Little Puppy and The Saggy Baggy Elephant, and my new favourite is The Little Grumpy Cat that Wouldn’t. Having affordable books like this meant that for millions of kids like me, we suddenly had access to many more books than previously. The really exciting news is that Penguin Random House are celebrating this anniversary with a wonderful publishing program for 2017. 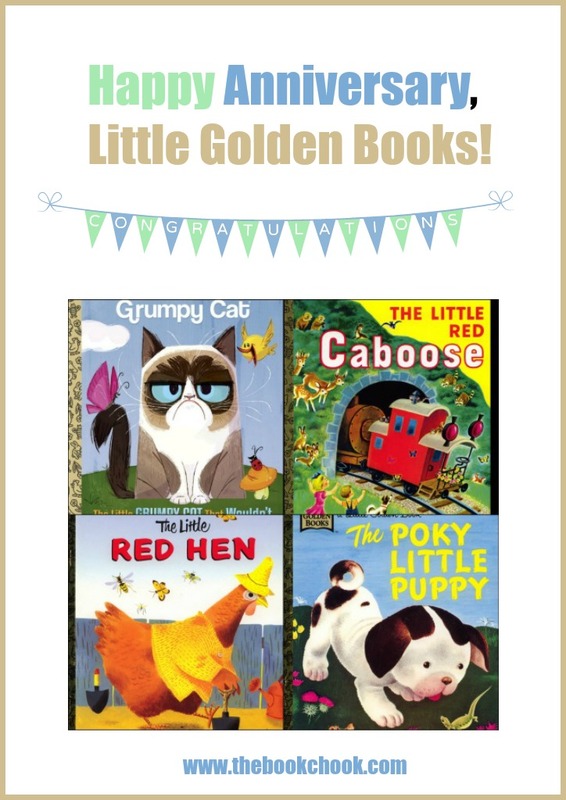 The RRP of the Little Golden Books will be $Au 4.99 each. What is it about cats? Kittens are always endearing, but there’s something about the cat attitude, the general air of non-compliance and aloofness, that is hilarious. This little cat is grumpy, despite being surrounded by animals intent on sharing their joy. (Or perhaps because of it?) Right from the start we see Grumpy Cat establishing gloom. The chirpy butterfly asks, “You know what’s great about the outdoors?” “NOTHING,” Grumpy Cat said. The unnamed author has done a fine job keeping text simple and full of humour. Laberis’s illustrations are colourful and with a great Golden Book “feel” to them. I LOVED Grumpy Cat’s very expressive eyes, and impressively turned down mouth, and kids will too. The Little Grumpy Cat that Wouldn’t makes a fun read-aloud, as well as a good choice for beginning readers. NB There is a real-life Grumpy Cat that the books are based on. The Little Red Caboose written by Marian Potter, illustrated by Tibor Gergely. First published 1953. The Poky Little Puppy by Janette Sebring Lowrey, illustrated by Gustaf Tenggren. First published 1942. Another little golden book that stands the test of time, The Poky Little Puppy shares the story of five little puppies who are full of mischief like puppies everywhere. But it’s the poky little puppy who is the naughtiest and keeps escaping to eat yummy desserts, despite stern warnings from his mother. There’s more reading in this one, but repetitive text makes it easier for young readers to predict and memorise, making The Poky Little Puppy another great choice for them. The Little Red Hen illustrated by J.P Miller. First published 1954. Everyone should have access to this folk tale about the little red hen who somehow had no offers of help when work was going on, but was inundated when it came time to eat the fruits of her labour. I love the repetition of question and answer which leads to a most satisfying ending, and the very pragmatic and hard working hen makes a great role model! Again the text is short, simple and repetitive - ideal for readers just starting out on their journey. What’s your favourite Little Golden Book? That is one cute cat!